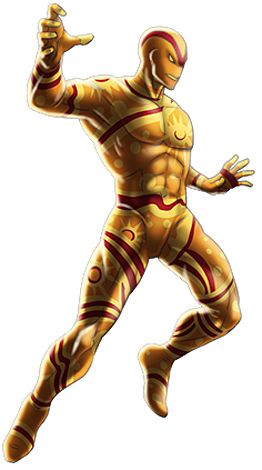 Telekinesis: Vector's body is covered in a strange yellowish substance with strange designs. He is able to telekinetically repel any object (within a certain area) away from himself and is able to change its force of velocity as well. By using his power, he is able to fly by "repelling" the ground beneath him. Simon Utrecht was a millionaire, public official, and industrialist who assembled a team to simulate the crash that led to the powers of the Fantastic Four. He promised each team member super powers due to exposure (although intentional, not accidental) to cosmic radiation. During this launch, Dr. Bruce Banner (known as the Hulk) was on hand at the base, and believing the ship to be having problems, guided it back to Earth. The now-changed humans called themselves the U-foes (possible in connection with Utrecht's last name) and blamed Banner for cutting short their radiation exposure.